Amos Decker, Baldacci’s hulking former NFL player and one-time police investigator, is back for a case involving death row inmates, a brutal double murder, and a shattered sports career. When readers first met Amos Decker, he was a socially inept giant mired in the past; his wife, daughter, and brother-in-law were brutally murdered in Decker’s own home. Living out of a tiny motel room and working as a private investigator, Decker finally solved their murders and helped the FBI put a relentless killer to bed. Now, Decker has reported for duty at a special FBI unit to work cold cases. Commanded by Special Agent Ross Bogart, the unit includes journalist Alexandra Jamison, clinical psychologist Lisa Davenport, and the sullen Todd Milligan, an FBI field agent. The team reports for their first day of duty and almost immediately travels from Quantico to Texas to work the case of a former NFL shoo-in, Melvin Mars, who—on the brink of the pro football draft—was arrested, charged, and convicted of killing his parents. But on the eve of Mars’ execution, another man in another state, also on death row, confesses to killing the pair. Upon their arrival in Texas, the team from Quantico finds the case against Mars makes less and less sense. When readers first met Decker, he was maladjusted and brilliant, his NFL career cut short by a vicious hit that altered his life and left him with perfect recall. And it was his incredible memory that solved his cases. This new, improved, vanilla Decker is less interesting than the damaged hero Baldacci first introduced. And while the case starts out with plenty of potential, Decker’s incredible memory really isn’t flexed much here, so it’s ultimately solved by ordinary detective work. 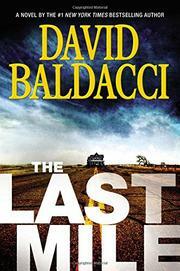 Riddled with implausible situations and light on the research, this plodding tale is for die-hard Baldacci fans only.